Forest Garden 3 x 6 Overlap Pressure Treated Pent Wall Shed: This Forest Garden overlap pressure treated shed is designed to sit against a wall as it has a flat side and sloped roof design. The shed is great if you are really limited on space but need outdoor storage. This shed has the door in the shorter front dimension and the side dimension is the longer dimension making this shed long and thin. 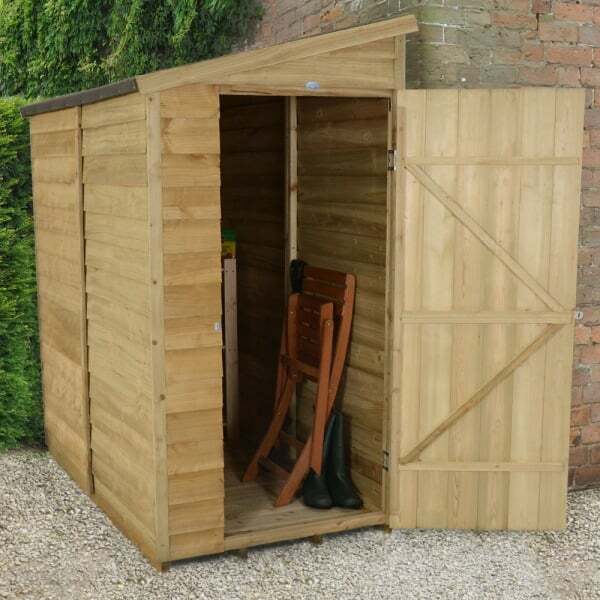 This shed is ideal for storing smaller tools and equipment and is a fantastic storage solution for where space is limited. This shed has a single door with a supportive Z frame and no windows to increase the security for the goods inside, this shed also benefits from hidden hinges and a hasp and staple lock for further security benefits. This garden shed has a robust pressure treated boarded floor and an OSB sheet material roof which comes with shed felt to provide a waterproof covering. This shed is pressure treated in the factory to give it the 15 year rot free guarantee so you will be sure you a buying a long lasting storage shed for your garden.